James May’s Man Lab is back for series 2 – excellent. Amazing video – more details at the Quantum levitation site and on Physics Stack Exchange. I attended the Wetherspoon 2011 Autumn Real Ale and Cider Festival, which ran 5 to 23 October 2011 and featured 50 real ales and 10 ciders. I’ve detailed the drinks I sampled at various different JDW pubs during the festival, with marks out of ten. The festival included American craft ale, shown as [US] below, beer brewed exclusively for the festival [exclusive], and resurrection beer (beer that has not been produced for some time brewed again for the festival) [resurrection]. Full details are given in the festival tasting notes [2.4MB PDF]. I went to the sixth meeting of the WordPress London local group at the Telegraph offices in Victoria on Thursday 20 October 2011. During the meetup, Paul Gibbs (pictured above), Developer at the Telegraph, gave an illuminating presentation on what’s involved in running the WordPress powered Telegraph blogs and MyTelegraph, the latter claimed to be the largest BuddyPress site in the UK. Graham Armfield also gave an interesting presentation on WordPress and web accessibility, giving those present plenty of food for thought. 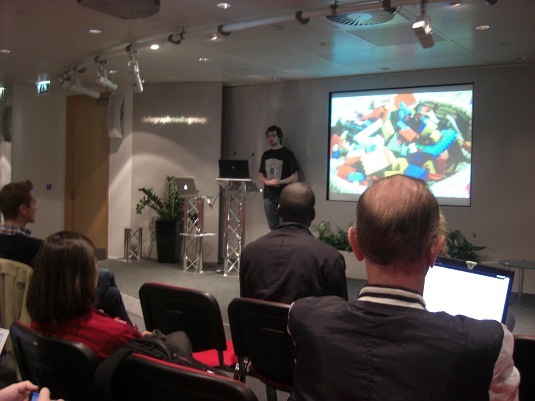 WordPress London meets on a monthly basis – if you’re not based in London see if there is a WordPress local group near you on the WordCamp UK wiki. Dries Buytaert, project lead for Drupal, and Matt Mullenweg, co-founder of WordPress, interviewed together (for the first time) at SchipulCon 2011 in Houston, Texas. Just upgraded to Ubuntu 11.10, which has been released today. The video, by Canonical Design, gives a brief taste of the new version of the operating system I use on a daily basis. Bids are invited to propose the venue for the follow-up to WordCamp Portsmouth UK 2011. The event is planned to be held on the weekend of 14-15 July 2012. This will be the fifth in the series of UK-based gatherings of WordPress publishers, designers and developers, which is held at a different location for each event. The first conference took place in 2008 at Birmingham, followed by Cardiff the following year, then Manchester in 2010, and finally Portsmouth earlier this year. The decision on the winning bid will be taken by the WordCamp UK mailing list. Those interested in proposing a venue should follow the procedure on the planning wiki – the deadline for bid submissions is Saturday 26 November 2011.